An incomparable brew of post punk electric energy and topical lyricism, London-based Belarusian Troubadour Sasha Ilyukevich and his British band ‘The Highly Skilled Migrants’ continue to challenge the boundaries of non-English contemporary music. Their forthcoming album ‘Minsk’, released in November 2018, is a rebellious and defiant comment on political and social order in the Post-Soviet era. Held under by the Kremlin and its imposed communist canons, Ilyukevich’s Motherland Belarus remains in the backwaters of public consciousness. Occasionally, news from Minsk streets about arrests of people protesting against the government might reach us. From this the capital of Europe’s Last Dictatorship a parallel newsfeed continues of the country’s so-called peacekeeping role between Russia and Ukraine. The censorship of political activists and artistic expression has become routine in Belarus. 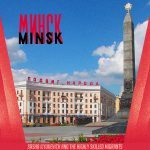 Minsk in particular has always been the epicentre of many movements challenging the state with voices against its established conditionality. Ilyukevich on ‘Minsk’: “With this record I offer my personal artistic outcry using Minsk as a prism to split the dislocated reality of the past, present, historical and social agenda of Belarus. My songs reflect the saturation by propaganda, controls of political powers and their direct impact on creating a philistine society. “Minsk” also is a microcosm of misinformation, which will be echoed across the media like a pandemic”. Many songs were revisited and finalised by Ilyukevich in early 2016 before a new line-up introduced heavier electric guitars and drums with experimental noise – all recorded at The Stables, London along with special guest pianist Andrey Novikov appearing on the last track ‘In Dream’, recorded by ‘The Highly Skilled Migrants’ at The Fish Factory. Sasha Ilyukevich writes songs in Russian to capture the essence of Eastern-Slavic heritage but translates his lyrics into English to convey the ideas behind his songs and share the nuances of language and emotion. His songs fuse Western and Eastern-Slavic sensibilities to bridge a historical divide and engage understanding between two cultures to reverse prejudice between East and West. Sasha Ilyukevich has been creating and performing music for the past 10 years. His songs often address political and social imbalances, particularly in the former-USSR. Ilyukevich’s first album ‘Ha Numa’ was banned from radio play in Belarus due to its perceived political subversion. His music has received positive press support in the UK, featuring on BBC World Service and New Statesman. In addition, Sasha Ilyukevich & the Highly Skilled Migrants have a long history performing at ‘Dash Arts’ events, promoting international cultures in Britain. In 2016 the band was selected to play the BBC Introducing Stage at Latitude Festival, UK. Ilyukevich’s songs have been also streamed on BBC Late Junction and Tom Robinson Radio Shows.